We in the United States, the Euro-zone, and Japan are already past peak oil demand. Oil demand has to do with how much oil we can afford. Many of the developed nations are not able to outbid the developing nations when it comes to the world’s limited oil supply. A chart of oil consumption shows that oil consumption peaked for the combination of the United States, EU-27, and Japan in 2005 (Figure 1). We can see an even more pronounced version of this pattern if we look at the oil consumption of the five countries known as the PIIGS in Europe: Portugal, Italy, Ireland, Greece, and Spain. All of these countries have had serious declines in oil consumption in recent years, as high oil prices have impeded their economies. Figure 2. Oil consumption for Portugal, Italy, Ireland, Greece, and Spain, based on EIA data. 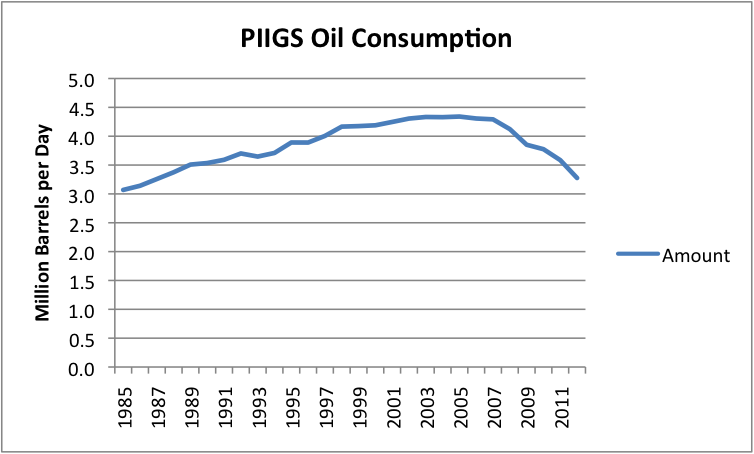 Oil consumption for the PIIGS in total hit its highest level in 2004, before the decline began. Peak oil consumption by country varied a bit: Portugal, 2002; Italy, declining since 1995; Ireland, peak in 2007; Spain, peak in 2007; Greece, peak in 2006. Peak demand is very much related to jobs. Peak oil demand occurs when a country is not competitive in the world market-place, and because of this, loses industry and jobs. One reason this happens is because the country’s energy cost structure is not competitive in the world market-place. According to reputation.com, with the run-up in oil prices starting about 2003, oil is by far the most expensive of the traditional energy sources we have available today. Countries that use a large percentage of oil in their energy mix can be expected to have a hard time competing, because of oil’s higher cost. Figure 3. 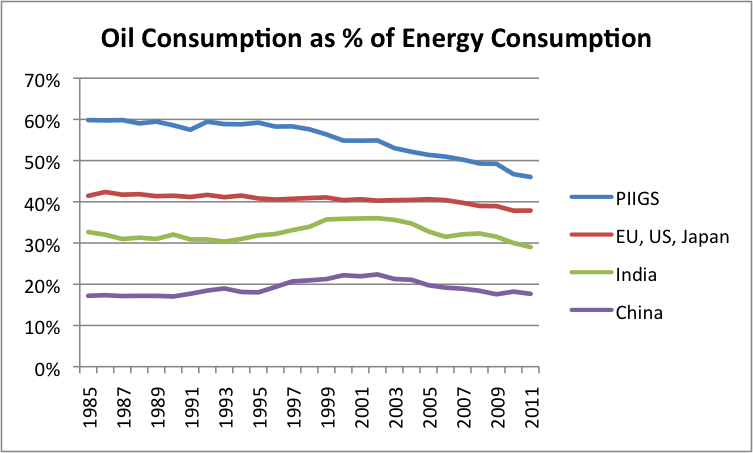 Oil consumption as percentage of energy consumption for selected countries, based on BP’s 2012 Statistical Review of World Energy. Anything else that is done which raises costs for businesses will also have an impact. This would include “carbon taxes,” if competitors do not have them, and if there is no tariff on imported goods to reflect carbon inputs. High-cost renewables can also have an adverse impact, regardless of whether the cost is borne by businesses, consumers or the government. If the cost is borne by businesses, those businesses must raise their prices to keep the same profit margins, and because of this become less competitive. If the cost is borne by consumers, those consumers will cut back on discretionary expenditures, in order to balance their budgets. This is likely to mean a cutback in demand for discretionary goods by local consumers. If the government bears the cost, it still must pass the cost back to businesses or consumers, and thus reduce competitiveness because of higher tax costs. This importance of competitiveness holds, no matter how worthy a given approach is. If costs were “externalized” before, and are now borne by the local system, it makes the local system less competitive. For example, putting in proper pollution controls will make local industry less competitive, if the competition is Chinese industry, acting without such controls. One issue in competitiveness is wage levels. Wages in turn are related to standards of living. In a global economy, countries with higher wage levels for workers, and higher benefit levels for workers (such as health insurance and pensions) will be at a competitive disadvantage. Countries that use coal as their prime source of energy will be at an advantage, because workers’ wages will tend to “go farther” in heating their homes and buying electricity. Countries that are warm in the winter will be at a competitive advantage, because homes don’t have to be built as sturdily, and don’t have to be heated in winter. Workers can commute by bicycle even in the coldest weather. Energy usage (all types combined, not just oil) is far higher in cold countries than it is in warm wet countries. Countries that extract oil also tend to be high users of energy. Figure 4. 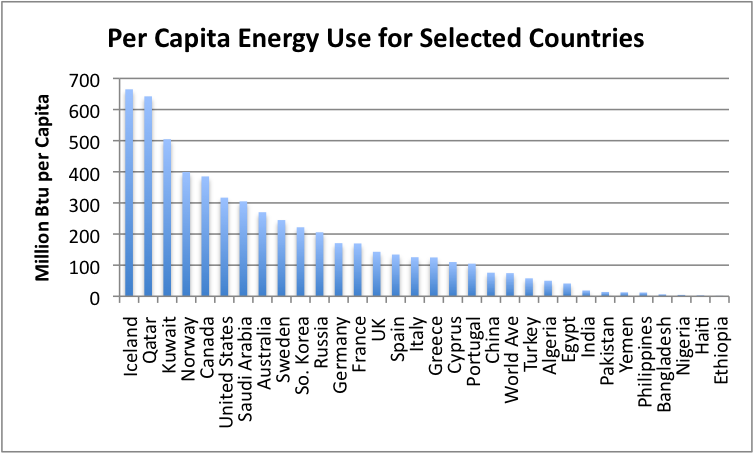 Per capita energy consumption for selected countries for the year 2010, based on EIA data. The difference in per capita energy usage among the various countries is truly astounding. 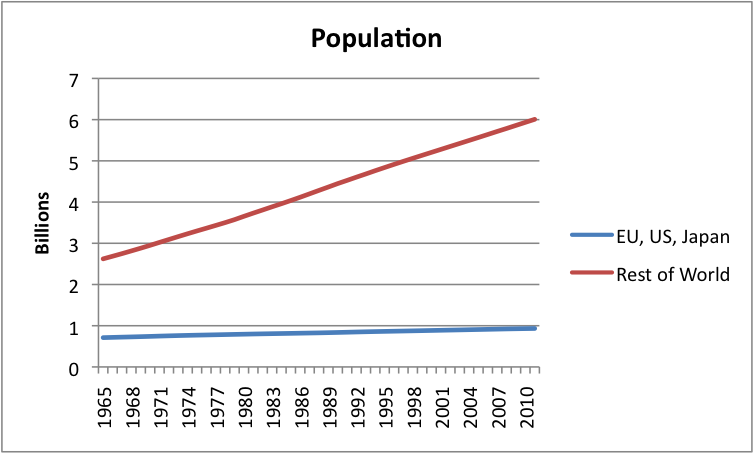 For example, Bangladesh’s per capita energy consumption is slightly less than 2% of US energy consumption. This difference in energy consumption means that salaries can be much lower, and thus products made in Bangladesh can be much cheaper, than those made in the United States. This is part of our competitiveness problem, even apart from the energy mix problem mentioned earlier. In my view, globalization brought on many of our current problems. Perhaps globalization could not be avoided, but we should have foreseen the problems. We could have put tariffs in place to make a more level playing field. See my post, Twelve Reasons Why Globalization is a Huge Problem. Inadequate world oil supply isn’t exactly the problem. The issue is far more that the price of oil extraction is rising. The price of oil extraction is rising for a variety of reasons, an important one being that we extracted the easy to extract oil first, and what is left is more expensive to extract. Another issue is that oil exporters now have large populations that need to be kept fed and clothed, so they don’t revolt. This is a separate issue, that raises costs, even above the direct cost of extraction. There is no reason to believe that these costs will level off or fall, no matter how much oil the US produces using high-priced methods, such as fracking. 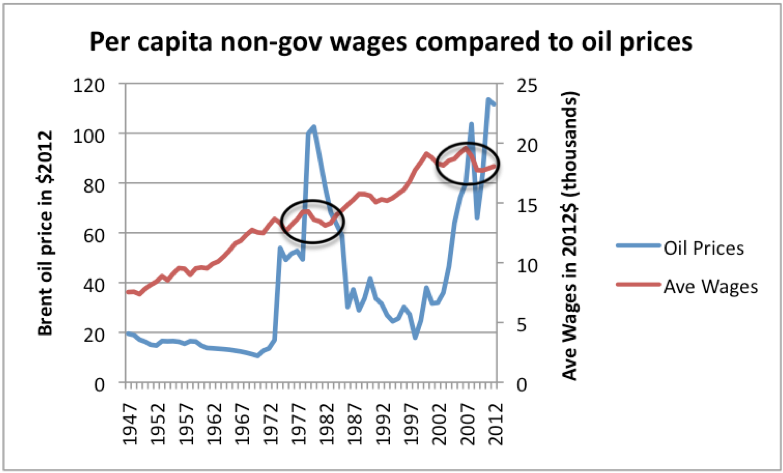 When oil prices rise, wages don’t rise at the same time. In fact, in the US there is evidence that wages stagnate when oil prices are high, partly because fewer are employed, and partly because the wages of those employed flatten. Figure 5. High oil prices are associated with depressed wages. Oil price through 2011 from BP’s 2012 Statistical Review of World Energy, updated to 2012 using EIA data and CPI-Urban from BLS. Average wages calculated by dividing Private Industry wages from US BEA Table 2.1 by US population, and bringing to 2012 cost level using CPI-Urban. The countries that are most affected by rising oil prices are the countries that use oil to the greatest extent in their mix of energy products. In Figure 3, that would be the PIIGS. The rest of the US, EU-27, and Japan would be next in line. When oil prices rise, consumers need to balance their budgets. The price of oil products and food rises, so they cut back on discretionary items. Their smaller purchases of discretionary goods and services means that workers in discretionary sectors get laid off. Businesses find that the price of oil used in manufacturing and shipping their products has risen. If they raise the sales price of the goods to reflect their higher costs, it means that fewer people can afford their products. This too, leads to cutbacks in sales, and layoffs of workers. Sometimes businesses decide to outsource production to a cheaper country, or use more automation, as a way of mitigating the cost increases that higher oil prices add, but automation or outsourcing also tends to reduce US wages. The net effect of all of these changes is that there are fewer workers with jobs in the countries with high oil usage. This reduces the demand for oil in the high oil usage countries, both from business owners making goods and from the consumers who might use gasoline to drive their cars. This price mechanism is part of what leads to the oil consumption shift we see in Figure 1. We are dealing with is close to a zero-sum game, when it comes to oil supply. The amount of oil that is extracted from the ground is almost constant (very slightly increasing for the world in total). If prices stayed at the low level they were in the past (say $20 barrel), there would not be enough to go around. Instead, higher prices redistribute oil to countries that can use it manufacture goods at low overall cost. Workers in factories making these goods are then able to afford to buy goods that use oil, such as a motor scooter. The substitution of natural gas for oil combined with increasing fuel economy means oil demand is approaching a tipping point. 1. There are way too many of “them” compared to the number of “us,” for energy efficiency to make even a dent in our problem. 2. When we look at past oil consumption, changes in vehicle energy efficiency did not make a big difference. 3. Substituting natural gas for oil still leaves cost levels for the US, Europe, and Japan very high, compared to those for the rest of the world, where little energy is used. 4. There are really separate markets in many parts of the globe. Our market is collapsing because of high price. Perhaps increased efficiency and natural gas substitution will help low-cost producers until they reach a different limit of some sort. Let’s look at these issues separately. There are way too many of “them” relative to us, for energy efficiency to even make a dent in our problem. Figure 6. World population split between US, EU-27, and Japan, and the Rest of the World. Using a ruler, we could probably make fairly reasonable projections of future population for each of these groups. Figure 7. Per capita oil consumption separately for the group US, EU-27, plus Japan, and for the rest of the world, based on BP’s 2102 Statistical Review of World Energy, and population statistics from EIA (since 1980) and Angus Maddison data. (earlier dates). Per capita oil consumption for the EU, US, and Japan group peaked in 1973–a very long time ago. In recent years, it has been drifting down fairly rapidly, just to keep up with a slight per capita rise in oil consumption of the Rest of the World. Even with recent changes, per capita oil consumption of the EU, US and Japan group is more than 4.5 times that of the rest of the world. If cars were made more efficient, more people could afford them. The market for cars is unbelievably huge, compared to today’s market, if costs could be brought down. Furthermore, gasoline accounts for less than half of US oil consumption. Even if efficiency were improved to allow cars to use half as much fuel, it would save a little less than one-fourth of current oil consumption. How far would this oil go in satisfying the needs of 6 billion other people–and growing every year? When we look at past oil consumption, changes in vehicle energy efficiency did not make a big difference. If we look at per capita oil consumption in the US, split between gasoline and other oil products, we see that the big drop in oil consumption came from the drop in other oil products–that is the commercial and industrial part of US oil consumption. Figure 8. 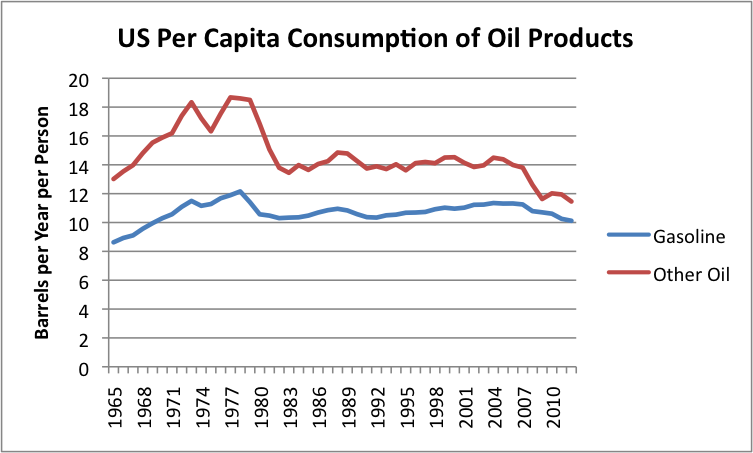 US per capita consumption of oil products, split between gasoline and other. Total consumption from BP’s 2012 Statistical Review of World Energy. Gasoline consumption from EIA. (Amounts include biofuels.) Difference by subtraction. The amount of fuel used for gasoline has stayed in the 10 to 12 barrels a year per capita band, since 1970, in spite of huge improvements in vehicle efficiency. I recently wrote a post called Why is US Oil Consumption Lower? Better Gasoline Mileage? In it, I looked at the decrease in US oil consumption between 2005 and 2012. I concluded that the majority of the decrease in consumption was due to a drop in commercial use. Only 7% was due to an improvement in miles per gallon for gasoline powered vehicles. Substituting natural gas for oil still leaves the US (as well as Europe and Japan) very high priced, compared to the rest of the world, that doesn’t use much energy. Living in the US, Europe or Japan, it is hard to get an idea of the cost structure of the rest of the world. We are so far above the cost structure of the rest of the world that substituting natural gas for oil would do little to fix the situation. Figure 9. 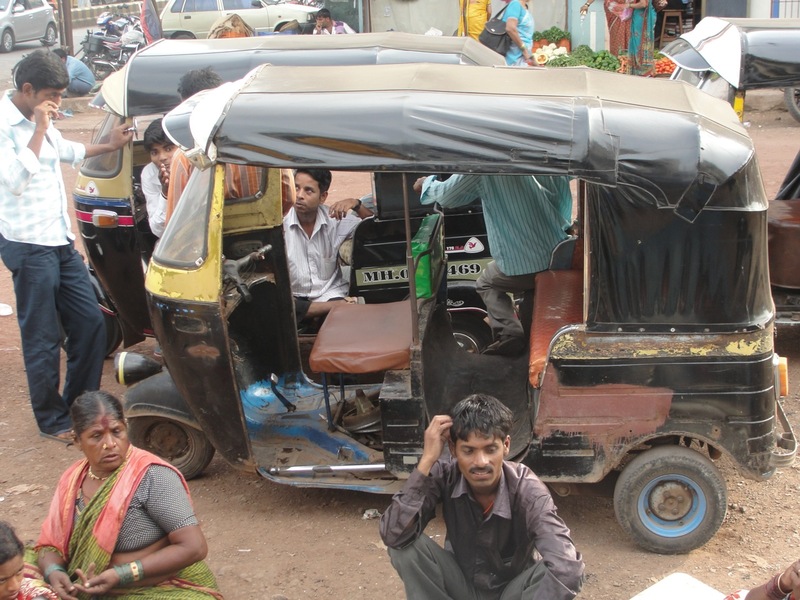 Photo of an auto-rickshaw I took while visiting India in October 2012. A total of 10 of us (including driver) traveled for several miles in a three-seated version of one of these. Those of us on the edges held on tightly to the frame, because there was not room for all of us. We can also debate how much substitution of natural gas will actually do, and in what timeframe. In the US, natural gas is temporarily very cheap. But it costs more to extract shale gas than the market currently pays, in many areas. Also, a recently University of Texas study showed that Barnett Shale was past peak production, if prices do not rise. There are really separate markets in many parts of the globe. Our market is collapsing because of high price. Perhaps increased efficiency and natural gas substitution will help low-cost producers, until they reach a different limit of some sort. When a country is not competitive, it is not just oil consumption that drops, but consumption of other energy products as well. 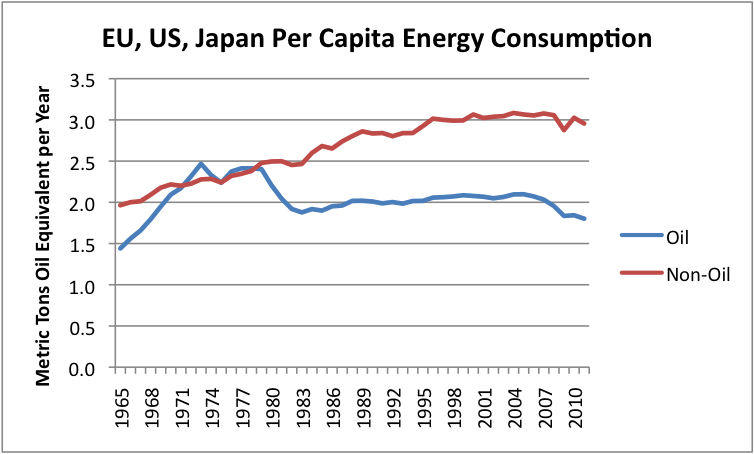 If we look at the per capita energy consumption of the US, EU-27, and Japan combined, we see that non-oil energy consumption per capita reached its peak in 2004, and is now declining (Figure 10, below). If consumers are too poor to buy oil products, they are also too poor to buy products made with other types of energy. Figure 10. Per capita consumption for the sum of the EU-27, US, and Japan, based on BP’s 2012 Statistical Review of World Energy. 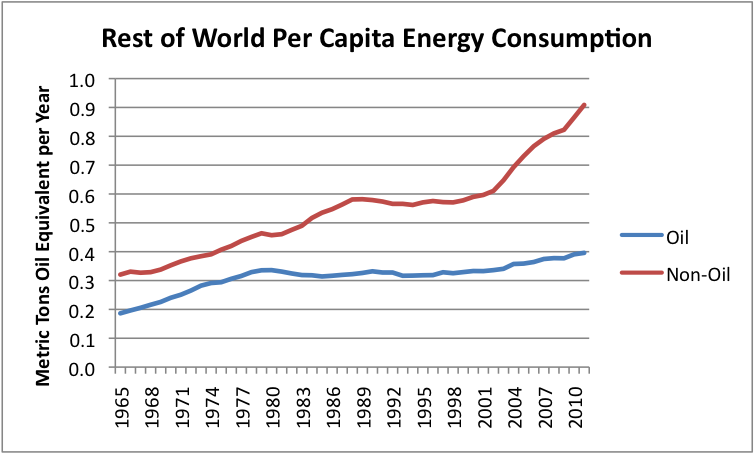 The Rest of the World followed a very different pattern of energy consumption. Non-oil consumption soared, on a per capita basis. 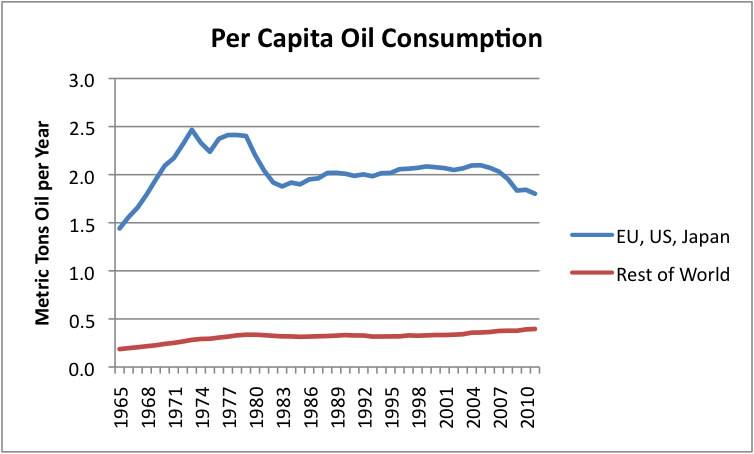 Oil consumption also increased on a per capita basis. Figure 11. Per capita energy consumption for the Rest of the World, based on BP’s 2012 Statistical Review of World Energy. More detailed data shows that the big increase in non-oil consumption was a huge rise in coal consumption, after China was admitted to the World Trade Organization in December 2001. How does peak oil demand work out in the end? I would argue that lack of competitiveness in world markets is a limit that the US, EU-27 and Japan are hitting right now, but at slightly different rates. EU-27 now seems to be ahead in the race to the bottom, partly because its combined currency. I wrote a post in March 2012 called Why High Oil Prices Are Now Affecting Europe More Than the US, explaining the situation. It seems to me, though, that a big piece of the problem with lack of competitiveness gets transferred to the governments of the affected countries. This happens because collection of tax revenue lags, because not enough people are working, and those who are working are earning lower wages. At the same time increased payouts are needed to stimulate the economy, and to provide benefits to the many without jobs. Governments increase their debt to meet the revenue shortfall. They reduce interest rates to record-low levels, to stimulate the economy. They also use Quantitative Easing, or “printing money” to try to lower long-term interest rates, and to try to make their exports more competitive. Unfortunately, these actions do not solve the basic structural problem of high and rising world oil prices, and the fact that these rising prices make their economies increasingly less competitive in the world marketplace. One possible way I see of the current situation working out is that the total energy consumption (including all types of energy products, not just oil) of the EU, US and Japan will continue to fall, as high-priced oil continues to erode our competitive position in the world marketplace. Figure 12. 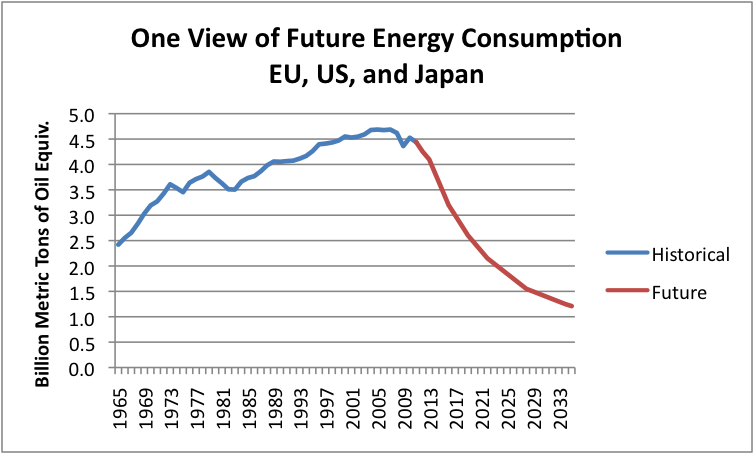 One view of future energy consumption for the EU-27, US, and Japan. Historical is based on BP’s 2012 Statistical Review of World Energy. The slope of the decline is based on the type of decline experienced by the Former Soviet Union, in the years immediately following its collapse. This pattern might reflect a combination of different patterns for different countries. Greece and Spain, for example might continue to fall quite quickly. The US might lag the EU in the speed at which problems take place. The likely path seems downward, because any action taken to fix the government gap between income and expense can be expected to have a recessionary impact, and thus have an adverse impact on energy consumption. The Rest of the World is now growing rapidly, but at some point they will start reaching limits. One of these limits will be lack of an export market. Another will be lack of spare parts, because businesses in the US, Europe and Japan are failing for financial reasons. Some of these limits will relate to pollution and lack of fresh water. The effect of these limits will also be to raise costs. For example, a shortage of water can be worked around through desalination, but this raises costs. Lack of spare parts can be worked around by building a new plant to make the spare part. Pollution problems can be mitigated by pollution controls, but these add costs. These higher costs, when passed on to consumers will also lead to a cutback in demand for discretionary goods, and the same kinds of problems experienced in oil exporting nations. Thus, these countries will also have “Peak Demand” problems, because of rising prices, related to limits they are reaching. I don’t know exactly how soon the Rest of the World will hit limits, but given the interconnectedness of the world system, it would seem to be within the next few years. Figure 13 shows one estimate of how this may occur. Figure 13. One view of energy consumption for the Rest of the World. Historical data are based on BP’s 2012 Statistical Review of World Energy. Here again, individual countries may do better than others. Countries with little connectedness to the world system (for example, countries in central Africa) may have fewer problems than others. Of course, their energy consumption (of the type measured by the EIA or BP) is very low now. They may use cow dung and fallen branches for fuel, but these are not counted in international data. Figure 14, below, shows the sum of the amounts from Figures 12 and 13. 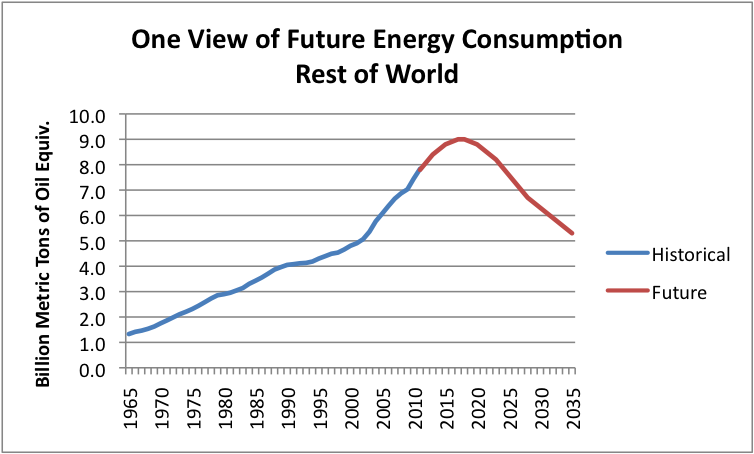 Thus, it gives one estimate of future world energy consumption based on Peak Demand considerations. Figure 14. 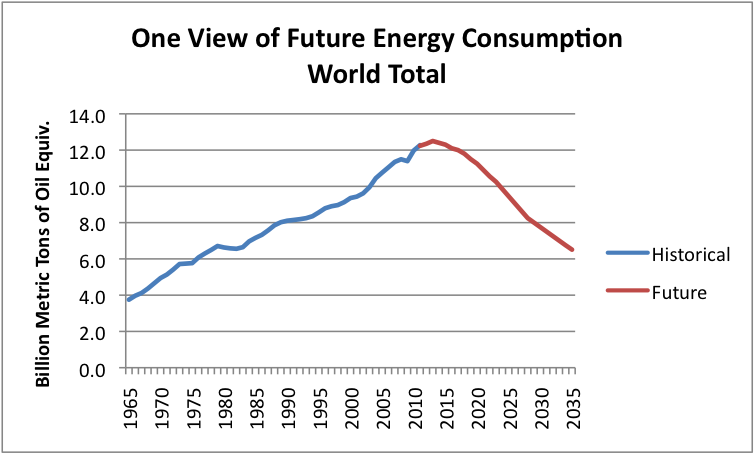 One view of future energy consumption for the world as a whole. History is based on BP’s 2012 Statistical Review of World Energy. If there is a silver lining to all of this, it is that world CO2 emissions are likely to start falling quite rapidly, because of Peak Oil Demand. World CO2 emissions could quite possibly drop below 20% of current levels before 2050. In the scenario I show, energy consumption drops faster than forecasts such as those put out by the Energy Watch Group. Such forecasts do not take into account financial considerations, so are likely overstated. 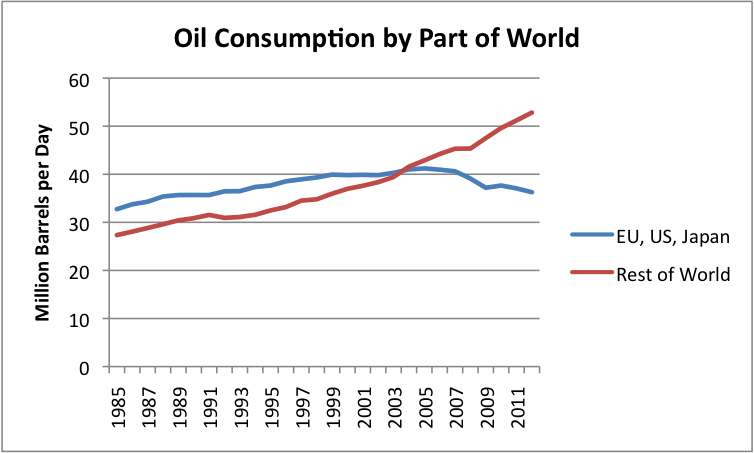 The downside of Peak Oil Demand is that the world we live in will be very much changed. Population levels will likely drop, indirectly because of serious recession, job loss, and cutbacks in government benefits. The financial system will need to be completely revised, because debt financing will make sense much less often than today. In fact, in a shrinking world economy, money can no longer act as a store of value. There no doubt will be some people who survive and prosper, but their lives will likely be very different from what they are today. This entry was posted in Financial Implications, peak oil and tagged CO2 emissions, competitiveness, energy consumption, oil demand, peak oil, peak oil demand. Bookmark the permalink. I am not sure I have good information about money volume, so it is hard to make a connection with respect to how it matches with energy, although there is clearly a connection. To a significant extent, money is debt. Debt is needed, both for the company extracting the energy source to have funds to pay in advance for its investment, and for the buyer of the new goods enabled by the energy (a car or refrigerator) to afford to purchase the item, because without the new energy source, both the investor and the buyer would be too poor to afford the new energy source and its output. The fact that the energy source has such as big payback has enabled this debt and its payback in the past. We are getting into trouble now because energy sources with poor paybacks are not adequate substitutes for ones with good paybacks.